So much has happened since I posted about my house last month. First of all, thank you to all my friends who suggested names for my house. My wonderful friend Karen dropped Midge into the Facebook comments and I knew it. was. perfect. 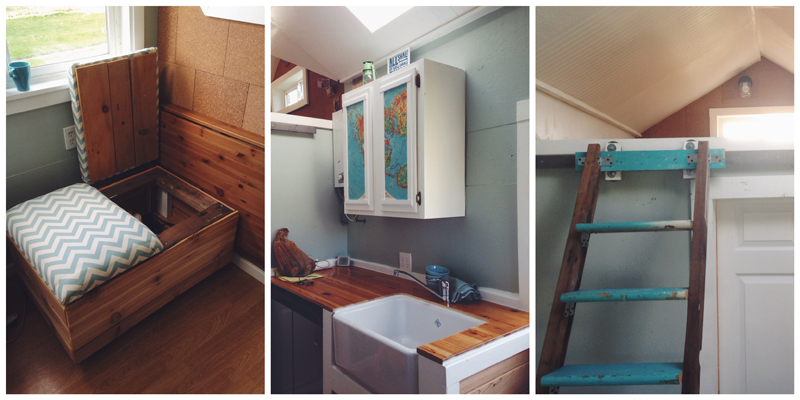 So #midgethetinyhouse is official. It is the redemption of a former Midge in my life. A person I thought I was before I grew into my own skin. If that doesn’t make sense to you, read this Midge blog post from my former life and see how different I was then. Last night I spent my first night in Midge the Tiny House. I have more work to do to create storage solutions and I have to resolve a hot water issue and finish my shower, but she is livable and I LOVE it. I still haven’t found the time or the space to write out all the stories from building my house. All the generosity and humor and wounded fingers. But I’ll get there … I think. You built a midge, so you MUST be the Barbie, the leading lady, the boss of your life. Love it. Oh my goodness Abby, I totally didn’t think of it that way. I LOVE THAT. I really like your midge – esp the world map cabinets. You inspire me to create my own midge (not necessarily a house, but something small that means little to anyone else but the world to me).